"There's so much hype about 2S35, but in the end, it's nothing special about it... XM2001 done this, and probably more and better 15 years ago when first SPH was delivered for tests." A technically very badly conceived......and not surprisingly never realized......."dinosaur" system even only named in the same phrase with Коалиция-СВ, ostensibly what will represent, by a very far edge, the most advanced and efficient self propelled artillery at world for the next two or three decades at least, is madness in itself. Practically do not exist a single cardinal parameter ,for not say the features of Коалиция-СВ without even a true corresponding anywhere abroad, where XM2001 could remain even in the same league with Коалиция-СВ. If any it show one more time what level of low level impudence can reach PR (or money....) influenced people, even more when keeping a deeply buried grudge and masked inferiority complex, in defending gold plated powerpoint garbage systems. it is similar to the American M-109A6, or is it the A9? Both seems to have the same electronic, but from their own origins. The most newest is the computerized C3I-System in connection with GPS/GLONASS. And also the newest smart ammunition is part of it. - Doesn't have radar-guided fuze shells. It's not in the same league, and anyone saying otherwise is uneducated or simply biased. XM2001 isn't even competing with the 2S35, it was competing for relevancy against the M109. Russia's advanced self-propelled howitzer, the Koalitsiya- SV, is capable of firing high-precision shells, which are navigated using a GLONASS module, according to the Russian newspaper Rossiyskaya Gazeta. George1 wrote: Russia's advanced self-propelled howitzer, the Koalitsiya- SV, is capable of firing high-precision shells, which are navigated using a GLONASS module, according to the Russian newspaper Rossiyskaya Gazeta. I think its meant as a joke, since you can see the chassis ( presumably 2S19, or perhaps new chassis? ) in that picture. Actually no, it's a wheeled Koalitsiya platform, it's easy to tell with a larger photo. You can see the stabilizers. + on top of that, the turret would be much higher off the ground due to being on a tracked platform that is on top of the platform attached to the hitch. So in other words, yeah, this is indeed looking like a wheeled platform. Old concept art but looks pretty spot on. Personally, I would get a bigger truck just to be safe. Ideally one with armored cab. 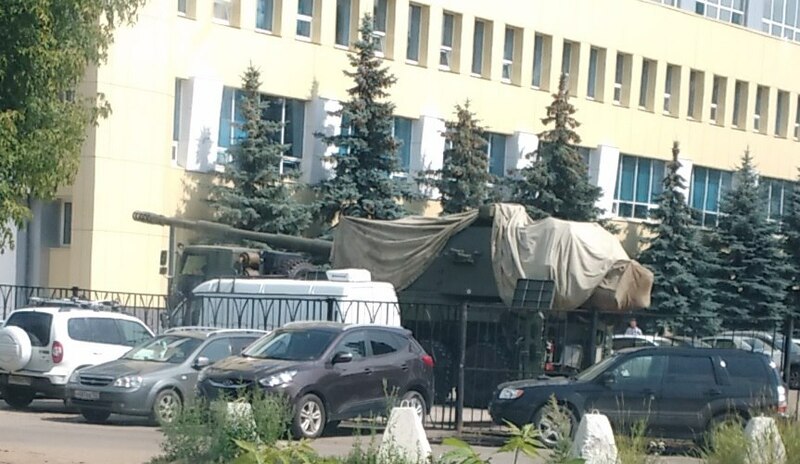 The "wheeled Koalitsiya"was seen in Nizhny Novgorod a few days ago. NPK "Uralvagonzavod" (DC) is preparing a series production self-propelled artillery "Coalition-SV", told reporters on Wednesday the general director Oleg Siyenko. "Go test machine. Tests quite successful ", - said Siyenko, answering the question whether the supply of the" Coalition-SV "on exports planned. However, he noted that priority delivery of a new installation of the Russian army. Siyenko noted that in order to prepare series production of the new installation carried out a major modernization of production, including the plant number 9. Siyenko also said that the new installation is much better options compared to its predecessor - "MSTA-S" - including the range, rate of fire, road performance. 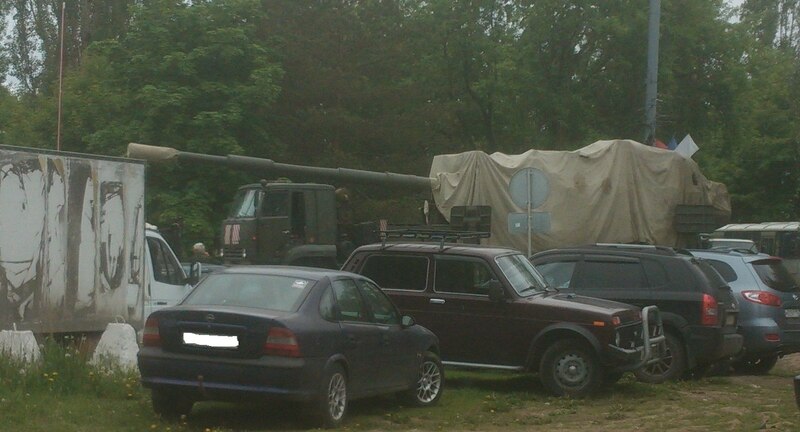 Self-propelled artillery unit "Coalition-SV" - Russia's 152-mm self-propelled howitzer Brigadier level. "Thunderbird" is developed in Nizhny Novgorod Research Institute. SAU 2S35 is designed for the destruction of tactical nuclear weapons, artillery and mortar batteries, tanks and other armored vehicles, anti-tank weapons, manpower, facilities and missile air defense, command and control centers, as well as to destroy field fortifications and obstructing the maneuvers of enemy reserves. Perspective pattern RAV 152mm SG "Coalition - CB"
Developer - CRI "Petrel", "Uraltransmash" Manufacturer - CRI "Petrel", "Uraltransmash" Assignment : Self-propelled howitzer 2S35 Brigadier level designed to destroy tactical means, artillery and mortar batteries, tanks and other armored vehicles, anti-tank weapons, manpower, air defense and missile defense command and control centers, as well as to destroy the fortifications and obstructing the maneuvers of enemy reserves in the depth of his defense. The crew - 2 (3) persons. Extra machine-gun armament - 1h12,7mm "Kord"
Good news that it can hold 70 rounds, while the weight doesn't exceed 48 tons. Now that we know it wont exceed 48 tons, one of the obstacles for adding the second gun has been nearly eliminated, with the idea of a dual gun Koalisiya not being able to be moved by tactical airlift (due to weight). The real question would be is the additional expense and complexity of a second gun be warranted with the performance increase? Is the performance increase necessary? Time will tell. Adding a second gun to a 152mm calibre artillery system makes little real sense. It would make the vehicle much heavier and bigger and add a lot of complication by adding an extra gun... beefing up the stabilisation and aiming systems and adding a further two linkless ammo feeds to supply ammo to the second gun. The only real advantage of a second gun is an increase in rate of fire, but it cheaper and easier to simply assign more vehicles to a target than lumber the chassis with the extra weight of another gun. the only time multiple guns is a good thing is in an anti aircraft weapon that relies on raw rate of fire to be effective... and even that is changing with guided shells making extra barrels redundant in larger calibre weapons. I wonder what type of armor it has? On Armata or modified T-90 chassis?